Clean and crisp lemon appears in wonderful ways throughout cooking and cleaning products. I am a big fan of lemon, remembering the scent from my childhood, with a wedge of lemon for tea, or that cleaning solution my mom used that made the kitchen sparkle. What do we know about lemon? Lemons were known to the Jews of Jerusalem, who, according to Josephus, pelted an errant high priest with them during a festival in the 90s BC, although Jewish tradition maintains that this was done with citrons, not lemons. They entered Europe near southern Italy no later than the 1st century AD, during the time of Ancient Rome. However, they were not widely cultivated. They were later introduced to Persia and then to Iraq and Egypt around 700 AD. The lemon was first recorded in literature in a 10th-century Arabic treatise on farming, and was also used as an ornamental plant in early Islamic gardens. It was distributed widely throughout the Arab world and the Mediterranean region between 1000 and 1150. The first substantial cultivation of lemons in Europe began in Genoa in the middle of the 15th century. The lemon was later introduced to the Americas in 1493 when Christopher Columbus brought lemon seeds to Hispaniola on his voyages. Spanish conquest throughout the New World helped spread lemon seeds. It was mainly used as an ornamental plant and for medicine.In the 19th century, lemons were increasingly planted in Florida and California. In 1747, James Lind’s experiments on seamen suffering from scurvy involved adding lemon juice to their diets, though vitamin C was not yet known. According to the web, lemon essential oil has more than culinary uses: Lemon oil may be used in aromatherapy. Researchers at The Ohio State University found that lemon oil aroma does not influence the human immune system, but may enhance mood. The low pH of juice makes it antibacterial. We use it to make a rich lathery soap we have just renamed “Lemon Comfrey Crunch Soap”. (Thank you to Linda Zolton Woods for the winning name in our name the soap contest) Our soap is cold processed blend of olive, coconut and palm oil that is saponified with a blend of the double strength lemon essential oil, corn meal, comfrey leaves and for color we are using Turmeric. We like the organic and natural qualities of turmeric to color the soap. And we love that the soap gently lifts strong cooking flavors and scents from your hands. Did you know that lemon is one of the most difficult flavors to maintain in a soap… the action of the chemistry of oils and lye turning to soap breaks down some of the strength of lemon essential oil…. but i think you will love ours if you love lemon. If you a re interested in our soap, click on the photo above to be taken to our etsy shop. Each bar of soap is individually wrapped to keep the soap fresh and sanitary for your use. 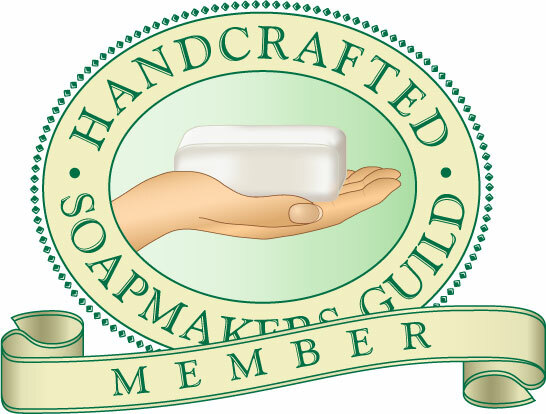 We are proudly able to display the Handcrafted Soapmakers Guild seal as members in good standing. That means our soap meets their professional standards for handcrafted soap.